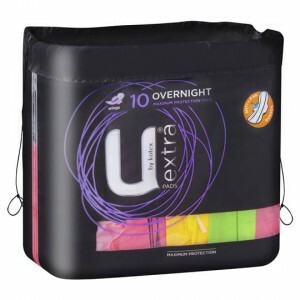 U By Kotex Overnight Pads Extra protection are fantastic for those heavy days/nights. Super absorbent, light and flexible, and no leakage means confidence and comfort. These overnight pads (extra) are brilliant protection especially during the first couple of days of my period. I never experience any leaks with this product and best of all they don’t bunch up or feel bulky. These are probably one of the best products for overnight. They have great length for extra protection against leaks. would definantly recommened them to others. I used these pads after giving birth – never had any leaks! Very comfortable, not too bulky. Good price for a great product too! Will buy again. I love the overnight brand of U by Kotex. It keeps me dry and my sheets safe! Other brands do not compare to the quality of this one! I found these pads great for when I was heavy and needed that extra protection and comfort overnight. They are extra absorbent stay in place and have a wider coverage than other brands I’ve used. How would you rate U By Kotex Overnight Pads Extra?